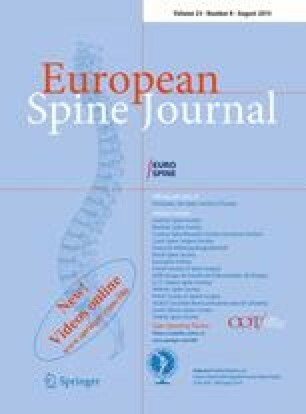 There is an increasing awareness of the risks and dangers of exposure to radiation associated with repeated radiographic assessment of spinal curvature and spinal movements. As such, attempts are continuously being made to develop skin-surface devices for use in examining the progression and response to treatment of various spinal disorders. However, the reliability and validity of measurements recorded with such devices must be established before they can be recommended for use in the research or clinical environment. The aim of this study was to examine the reliability of measurements using a newly developed skin-surface device, the Spinal Mouse. Twenty healthy volunteers (mean age 41±12 years, nine males, 11 females) took part. On 2 separate days, spinal curvature was measured with the Spinal Mouse during standing, full flexion, and full extension (each three times by each of two examiners). Paired t-tests, intraclass correlation coefficients (ICC), and standard errors of measurement (SEM) with 95% confidence intervals were used to characterise between-day and interexaminer reliability for: standing sacral angle, lumbar lordosis, thoracic kyphosis, and ranges of motion (flexion, extension) of the thoracic spine, lumbar spine, hips, and trunk. The between-day reliability for segmental ranges of flexion was also determined for each motion segment from T1-2 to L5-S1. The majority of parameters measured for the ‘global regions’ (thoracic, lumbar, or hips) showed good between-day reliability. Depending on the parameter of interest, between-day ICCs ranged from 0.67 to 0.92 for examiner 1 (average 0.82) and 0.57 to 0.95 for examiner 2 (average 0.83); for 70% of the parameters measured, the ICCs were greater than 0.8 and generally highest for the lumbar spine and whole trunk measures. For lumbar spine range of flexion, the SEM was approximately 3°. The ICCs were also good for the interexaminer comparisons, ranging from 0.62 to 0.93 on day 1 (average 0.81) and 0.70 to 0.94 on day 2 (average 0.86), although small systematic differences were sometimes observed in their mean values. The latter were still evident even if both examiners used the same skin markings. For segmental ranges of flexion, the ICCs varied between vertebral levels but overall were lower than for the global measures (average for all levels in all analyses, ICC 0.6). For each examiner, the average between-day SEM over all vertebral levels was approximately 2°. For ‘global’ regions of the spine, the Spinal Mouse delivered consistently reliable values for standing curvatures and ranges of motion which compared well with those reported in the literature. This suggests that the device can be reliably implemented for in vivo studies of the sagittal profile and range of motion of the spine. As might be expected for the smaller angles being measured, the segmental ranges of flexion showed lower reliability. Their usefulness with regard to the interpretation of individual results and the detection of ‘real change’ on an individual basis thus remains questionable. Nonetheless, the group mean values showed few between-day differences, suggesting that the device may still be of use in providing clinically interesting data on segmental motion when examining groups of individuals with a given spinal pathology or undergoing some type of intervention. This study was funded by the Swiss National Science Foundation (grant 32-57123.99) and the Schulthess Klinik Research Funds.